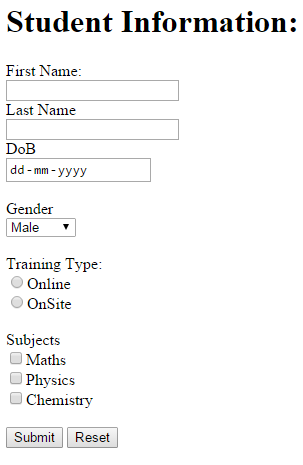 The HTML form is a collection of input controls where user can enter the data. Here, you will learn how to display AngularJS form and submit the data. We will create following Student Information form with submit and reset functionality. The following is the code of the above form. //6. create resetForm() function. This will be called on Reset button click. Create an HTML page and wrap all the necessary input controlls into <form> tag. Create the AngularJS application module in the <script> tag. Create studentController in application module. Create originalStudent object and attach to the $scope with required properties. This will stay unchanged during entire life cycle. Create new student object and attach to the $scope and copy all the properties and values from originalStudent. This student object will be bound to the form using ng-model directive. Therefore, if user changes form values then the student object will also get changed. Create submitStudnetForm function which will get called when user submits the form using Submit button. Here, send http POST request to the remote server to submit the data using $http service. Create resetForm() function, which will reset the form values to the originalStudent values by copying it to student object. Apply ng-model directives to each HTML input element to bind appropriate properties of student object. Apply ng-submit directive to form which will call submitStudentForm() on the form submit event. Apply ng-click directive to reset button which will call resetForm() on the button click event. An AngularJS form can be submitted using either ng-submit or ng-click directive but not both. Ng-submit: Binds angular expression to onsubmit event when form does not include action attribute. Ng-click: Binds angular expression to onclick event. Note : The angular form can be submitted using ng-submit directive on the form tag or using ng-click directive on <input type="submit" /> element. Use either ng-submit or ng-click directive but not both to submit the form. The form will be submitted twice if both ng-submit and ng-click directives are used.